2015 has been an absolutely incredible journey. At the start of 2015, I wrote a journal entry from the perspective of finishing up the year and reflecting. It was mostly around personal growth, and I wanted to have something that I could use to compare where I wanted to be at the start of the year, and where I ended up. This time last year, I was in the process of a career change, struggling to relate to the developer community, and trying to figure out how to turn my love of VR into something that I could do full-time. I was much shier and was having a hard time staying in contact with my friends, but was getting to the point where I knew I needed to change in order to make things happen. And change, things did! This year has turned out to be one of the best of my life, and I am confident that things are just getting started. With that, I want to share just a few of the highlights that have helped make 2015 amazing, and my hopes for what 2016 will bring. I often say that I have one of the best jobs on the planet – physical or virtual. For the past year, I’ve gotten to spend my days getting hands-on with the latest and greatest virtual and augmented reality technology, then teaching it to other developers through in-person classes, online tutorials, blog posts, and talks. I’ve gotten to get on stage and work on the public speaking goals, I’ve learned how to make and produce technical video content, build applications with the ever-changing Oculus SDK, and work with students at some of the largest hackathons in the world. Joining the developer evangelism team at the start of this year was one of the best decisions I made for becoming a better programmer, educator, and speaker. KittenVR is the first project that I developed for virtual reality that made it out of the idea stage. A few months into my role as a developer evangelist, I found myself lacking age-appropriate demo content for some of the kids I mentored, so I set out to build myself a game that I could use. Throughout the year, I’ve come back to KittenVR as a way to keep working on developing skills related to VR programming and I’m excited to work on it more over the next year to bring it even closer to a full release. Education of new developers is an incredibly important part of my personal philosophy, and I was thrilled to have the opportunity this August to teach a 1-week developer intensive course on beginning virtual reality development as part of the University of Bremen’s Informatica Feminale summer program for women in technology. I got a chance to work with some amazing developers, and seeing them inspired to work more with the VR field was an experience that isn’t quite like anything else I’ve had before. Highlights: Lessons on VR Development, Where has Liv Been? Towards the end of the year this year, a new San Francisco meetup group, AR/VR Women, was formed. 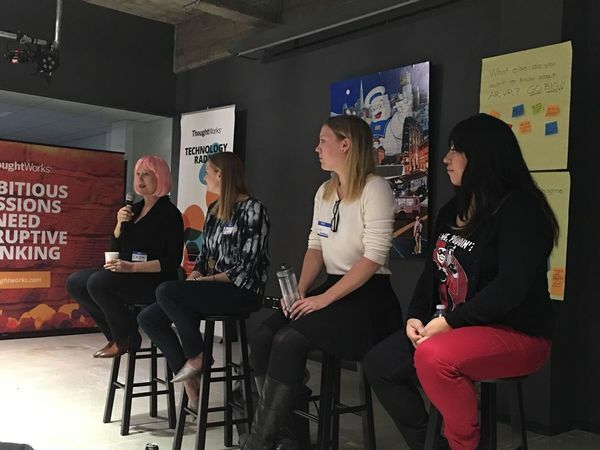 I had the fortune to be included on a panel of other women in the industry, where I got to share my passion for teaching VR development and meet with ~50 other women who were passionate about finding their own path into the growing industry. Diversity at this stage is critical – and this, in particular, I am thrilled to be a part of going forward into 2016. Lastly, I want to thank all of the amazing members of the VR & AR communities who I’ve had the pleasure of meeting and working with over the course of the past year. I can’t wait to see what you all come up with in 2016! Next PostMonday Musings: A Shoutout to the VR Developer Community!